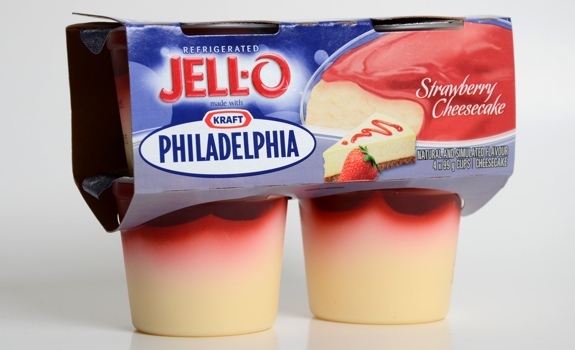 A package of four Jell-O Strawberry Cheesecake dessert cups. Who doesn’t love strawberry cheesecake? Rich cream cheese, strawberry topping and a graham cracker crust? Heaven. 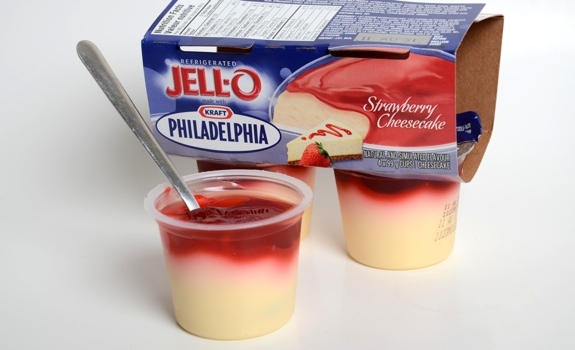 Why I thought Jell-O’s Strawberry Cheesecake dessert cups would meet any of those criteria is beyond me. First off, there’s no graham cracker crust at the bottom, which seems silly. 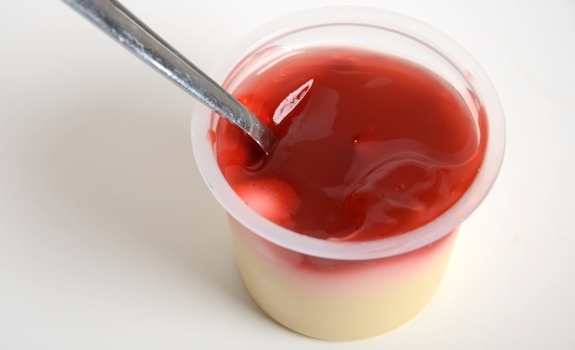 Next, the strawberry topping is more of an extruded jelly goo than a real strawberry anything. The label says there’s strawberry puree in the mix, but it tastes more like strawberry Jell-O (or strawberry Pop-Rocks, even) than real fruit. Finally, the cheesecake itself is something akin to a light mousse. It says it’s made with real Philadelphia cream cheese, and you can taste it, yes. But the authentic creamy density of real cheesecake is nowhere to be found. A pity, that. But here’s the thing. If they hadn’t gone and declared it a strawberry cheesecake dessert, I wouldn’t be nearly as disappointed. It’s actually pretty good, as long as you don’t compare it to real cheesecake, and the calorie count is reasonable for a quick after-dinner sweet treat. An open tub of Jell-O Strawberry Cheesecake. See? No graham cracker crust! Blasphemy! Cost: $3.99 for a four-pack of 99-gram cups at Sobeys in downtown Edmonton. Availability: Haven’t seen them around before, but that’s probably because I haven’t looked. Seems like the sort of thing that should be easy enough to find at decent grocery stores. Nutrition? : Per 99-gram tub: 130 calories, 2.5 grams of fat, 105 mg of sodium, 2 grams of protein. A bit of vitamin D, calcium and vitamin A. Pretty decent for a snack. Vegetarian friendly? : No! There’s gelatin in there! The verdict: Good, but not as good as real strawberry cheesecake. The layer of strawberry topping is OK, but not spectacular. It tastes fake, even though it apparently contains actual strawberry something-or-other. How long after the date are the strawberry cheesecake desert cups good. Mine say 11/20/14 and it 1127/14. Great review, my thoughts exactly!